The exam period is slowly approaching and it’s got to that time again for all GCSE, A Level and University students to step up the revision. Seeing as I’m in my first year of Sixth Form, I figured this will be my fourth year of exams and it’s fair to say I’ve got the hang of revising now. I thought I would share with you my top tips for Revision! Unlike GCSE, in A Level you don’t get books, just lots and lots of sheets. Be organised and get folders! I got these at the beginning of the year so I could start as I meant to go on. 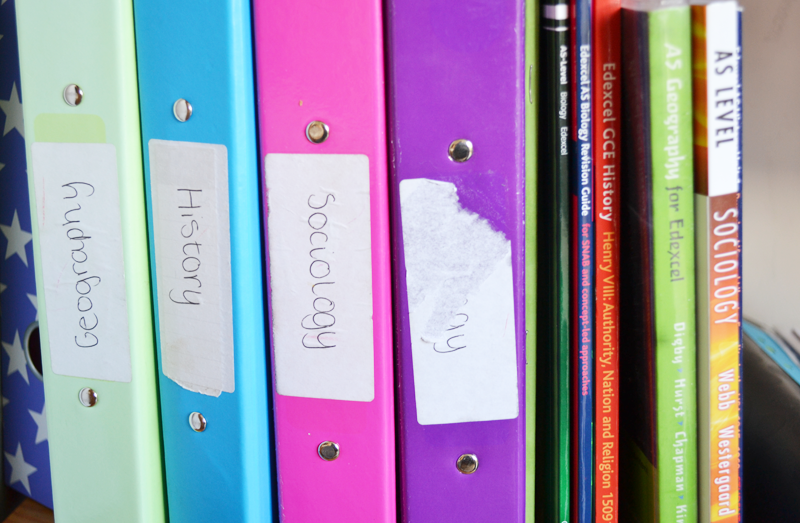 Whatever subject you’ve taken, you’re likely to have different topics and units so it’s a great idea to have some dividers too to keep everything in the right order. It also makes it a lot easier when going back to find something! There are hundreds of revision styles out there and you just have to find what works well for you, this may take some time but you’ll get there! You can do Q cards – these are perfect for condensing down information, mindmaps – perfect for when you’ve finished a unit/topic and posters – good if you’re finding too much writing boring and want to be a bit more creative. I’ve found the most important and a must do of revising it to do plenty of past papers, although it seems horrible at the time, I promise it will be worth it! Go onto your subjects exam board’s website and print all the past papers off. This way you can practice your exam technique and know what areas you need to revise further. It also gives you a much better idea of what questions are going to come up in the real thing. I’ve also found that sticking all your work up around the house can really help – stick on your kitchen cupboards, in the shower – everywhere you can think of! You’ll find yourself reading the work when you’re around the house and you can also get your family to quiz you on them too! Although, I like to keep my room a revision-free zone, it’s important to have somewhere to return to and relax, without the stress! Revise in a well lit room which is quiet and where you won’t get any distractions. I tend to use my brothers desk in his room which is right next to the window! Also, you want to take breaks in your revision. Tell yourself you’ll do 20, 40 or 60 minutes then you’ll have a 10 minute break to breath. Don’t cheat and say you’ll have a 10 minute break and it end up being an hour long! Eat well and sleep well! Make sure you’re eating your fruit and veg and just generally food that’s going to keep your energy levels high! Eating rubbish food really does make you feel a bit ‘poop’ and you never want that when exam times come. Sleeping is important too – I’m one of those people that needs their sleep. I go to bed at 9/10 every night and if it’s any later I physically can’t stay awake in class. Get at least 8 hours sleep every night if you can. Following on from the last point – make a cut-off point! You don’t want to be working into the early hours of the morning so you need to decide when you’re going to put the revision away and chill. For example, I hate working after 9 o’clock, so that’s when I stop. I find you tend to stop taking the information in as it gets later so it’s not much point in continuing! B R E A T H. Take some time out for some you time. Yes you need to be revising a lot, but stress is something that will soon knock you down. You need to have some time to relieve the stress so organise something with friends, maybe a walk? Fresh air will always do you good. I also like to have a day a week where I wont do any work, normally a Friday! And last of all.. stay positive, know you can do it and you will!